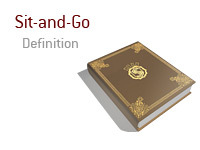 What does the term "Sit-and-Go" mean in poker? What is the definition of the term "SNG"? SNG is an acronym for Sit-and-Go, a single-table online poker tournament. Sit-and-Go tournaments do not have a scheduled start time. A sit and go begins as soon as there are enough people registered at a table. If the number of people required for the Sit-and-Go tournament to start is ten, then the tournament stars as soon as the tenth player joins. A single-table sit and go tournament typically has either six, nine or ten players. Sit and go tournaments have fixed payouts which are given to the top few finishers. Sit-and-Go tournaments are single-elimination or knockout tournaments where the loser of each match is immediately eliminated. SNGs are convenient for players who are not able to play for many hours in a row. SNGs are also great for the novice players who are learning the fundamentals of the game. Multi-table Sit-and Go tournaments are becoming increasingly popular. The rules are the same - when enough players join a table, the play begins. As participants are eliminated, the play is condensed to one table.